We are not a dedicated conference centre and do not pretend to have all the facilities that such a venue can provide. However, if you are after somewhere quiet, reasonably priced and a little bit different, we could be the place for you. Depending on the requirements of each individual or group, rooms may be booked by the hour (minimum one and a half hours) or by the day. 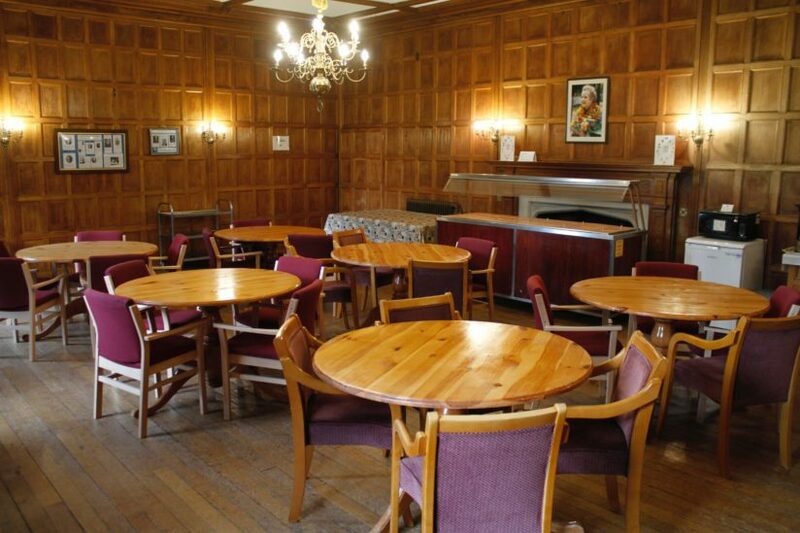 Room hire varies from £13 per hour (e.g. 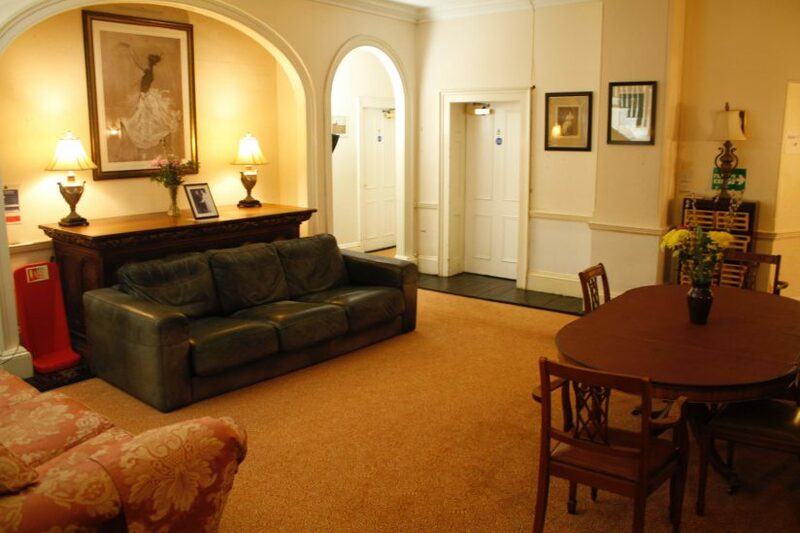 lounges or library) to £45 per hour (Chapel). 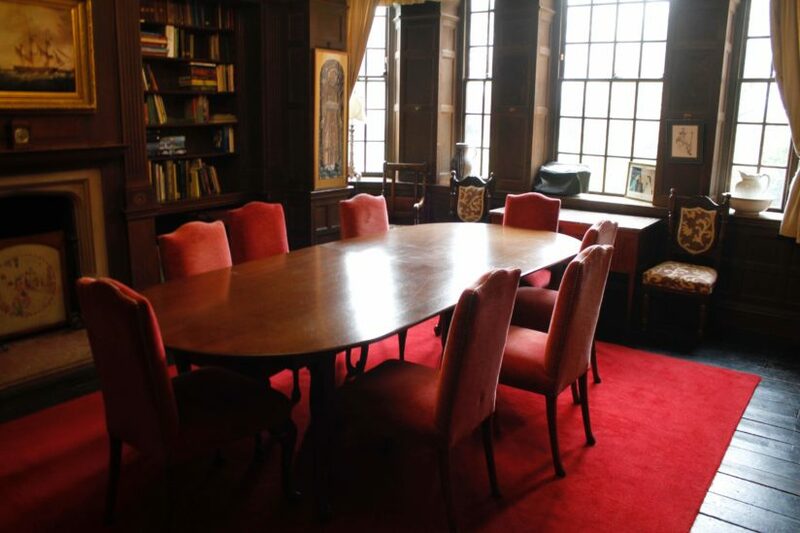 Exclusive use of the ground floor of St Katharine’s is possible if requested at time of booking for £700 per day. We can provide a data projector and screen, a pa system, flip-charts and pens and display boards. In winter, log fires can be lit in the entrance hall and blue room. If you have other requirements, please ask and we will do our best to provide them. There is free wi-fi throughout the house, and in 2019 this has been upgraded with the installation of access points throughout the main house. Please be aware that mobile phone coverage is patchy in this area. The larger of our two ground floor lounges, accessed directly directly from the entrance hall, the blue room overlooks the cedar tree and grounds to the side house. 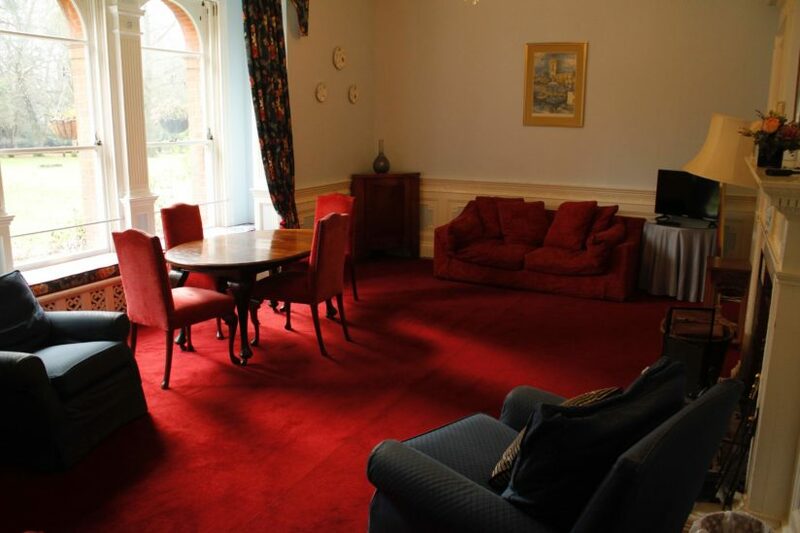 There are 2 large sofas, arm chairs and bench seating in the bay window. There is also a dining table suitable for 6. In total, the room can seat up to 20 people. There is a TV and DVD player for guest use. 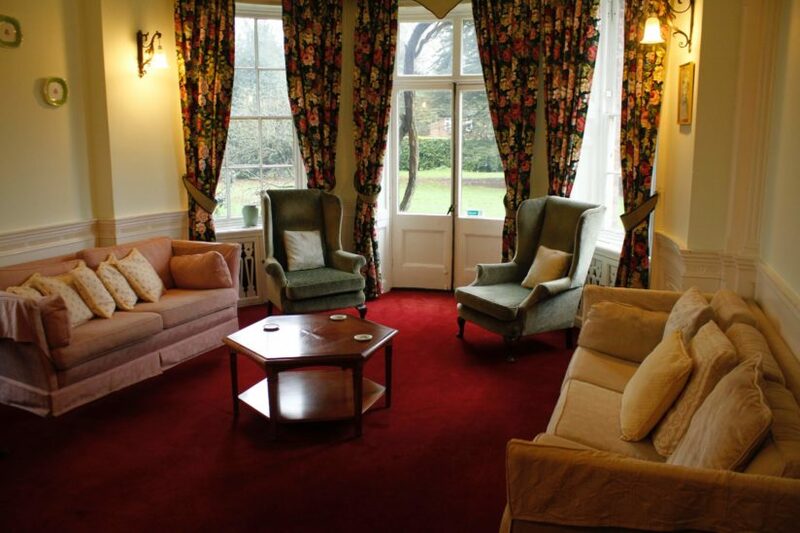 The smaller of our two ground floor lounges, accessed directly directly from the entrance hall, the green room opens onto the grounds to the side of the house. There are 2 comfortable sofas, arm chairs and space for several more chairs if required. There is a small writing table by one window. In total, the room can seat up to 10 people. The library has a large table which can comfortably seat 10 people around it. A variety of fiction and general non-fiction books are available for guest to borrow during their stay. 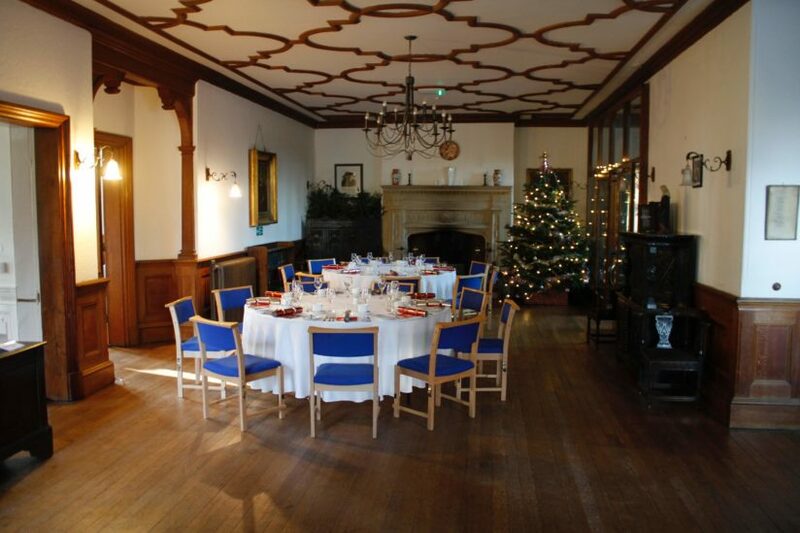 The oak-panelled dining room seats around 40 guest. As well as being used at mealtimes, it is generally a common area where hot drinks can be made. However it can sometimes be hired out for small or medium sized functions, such as an afternoon tea. 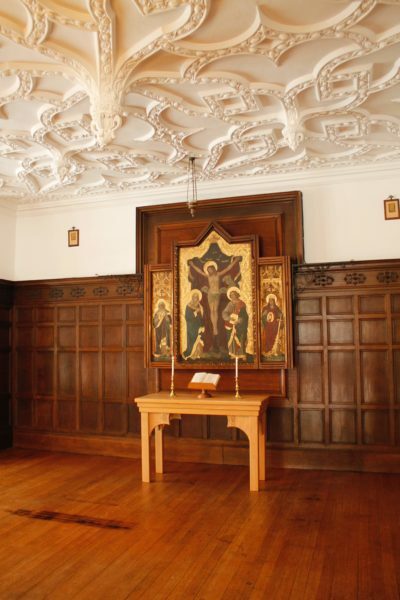 The Chapel (main hall) is a consecrated Anglican chapel. It can seat up to 120 in formal rows or 100 at circular tables for 10. There is no fixed furniture in this room, making it a very flexible space for a range of activities and workshops. The sanctuary leads off the library, and is a dedicated space for prayer and contemplation. It contains theology and devotional books which may be used by guest during their stay. 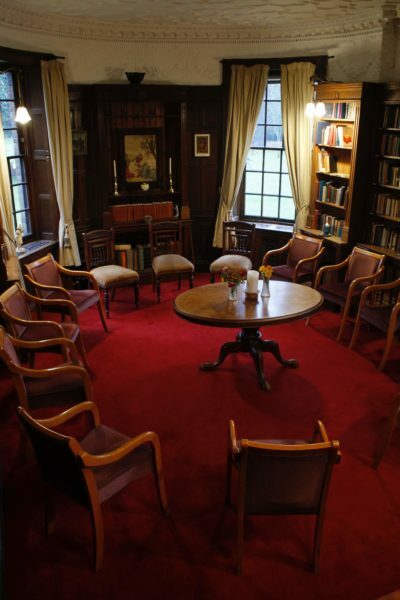 There is currently no set charge for this room for individuals wanting a non-residential day retreat, but a suggested donation of £20 per person is appreciated. 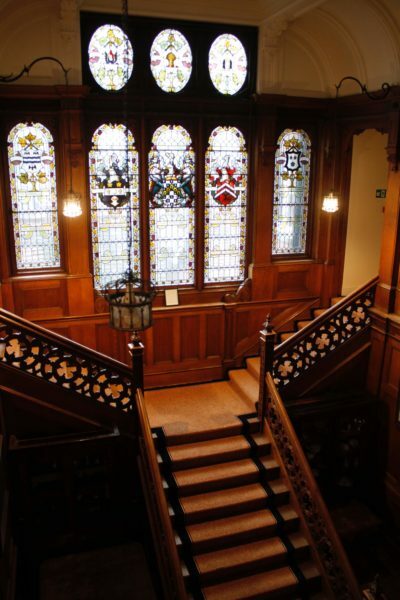 The grand main staircase leads out of the entrance hall and divides in front of the stunning stained glass window. The main staircase leads to a large open area. There is comfortable seating where guest can relax together. A large table and chairs provides a place to work, write or craft. Rooms 1 to 8 leads directly off this space.